What’s happening on the Korean peninsula? If you read the press or listen to the talking heads, your best guess would be that an insane North Korean regime is willing to risk war to manage its own internal political tensions. This conclusion would be hard to avoid because the media rarely provide any historical context or alternative explanations for North Korean actions. The armistice that ended the Korean War fighting established the Demilitarized Zone (DMZ) which separates North Korea from South Korea. At that time, the U.S. government unilaterally established another dividing line, one intended to create a sea border between the two Koreas. That border is illustrated on the map by line A, the blue Northern Limit Line (NLL). As you can see, instead of extending the DMZ westward into the sea, the U.S. line runs northward, limiting North Korea’s sea access. The line was drawn this way for two reasons: First, when the fighting stopped, South Korean forces were in control of the islands off the North Korean coast and the U.S. wanted to secure their position. Second, control over those islands enhanced the ability of U.S. forces to monitor and maintain military pressure on North Korea. North Korea never accepted the NLL. 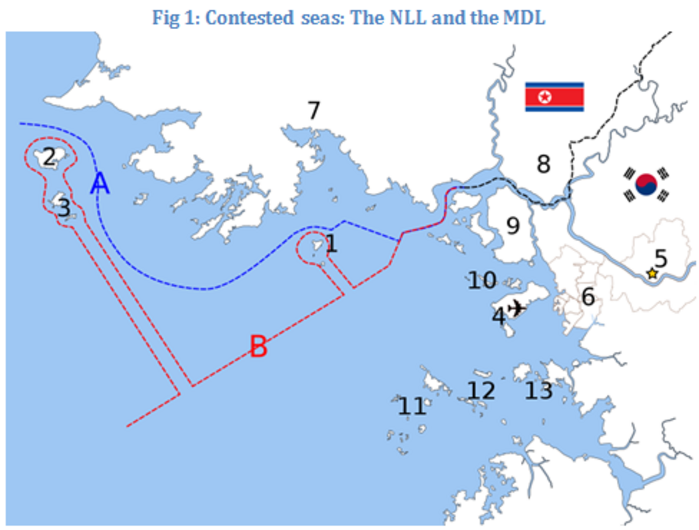 It argued for an alternative border, illustrated by line B, the red West Sea Military Demarcation Line (MDL). Acknowledging the reality of Southern forces on the islands off its coast, North Korea sought recognition for a sea border that went around the islands but otherwise divided the sea by extending the DMZ line. Then-Secretary of State Henry Kissinger wrote in a 1975 classified cable that the unilaterally drawn Northern Limit Line was “clearly contrary to international law.” Two years before, the American ambassador said in another cable that many nations would view South Korea and its U.S. ally as “in the wrong” if clashes occurred in disputed areas along the boundary. . . . However, a few months after the summit, the newly elected and current South Korean president, Lee Myung-bak, rejected the agreements reached at that summit and the previous one held in 2000. Lee openly derided past South Korean efforts to improve relations with, and called for aggressive actions against, the North. The U.S. government supported Lee’s position. What about the most recent incident involving the North Korean artillery attack on Yeonpyeong Island? The South Korean position is that its military was merely engaged in “routine” war games (involving over 70,000 troops), which also happened to include the firing of live ammunition into the sea from a military base on the island. It had done nothing to provoke a North Korean artillery attack on the base. Many unanswered questions remain about the Cheonan sinking and the Yeonpyeong attack. However, what does appear clear is that there are many complexities surrounding these events that are never made public here in the U.S., and that these omissions end up reinforcing a view of North Korean motivations and actions that is counterproductive to what should be our goal: achieving peace on the Korean peninsula. What might help? How about encouraging the U.S. government to accept North Korean offers to engage in good faith negotiations aimed at signing a peace treaty to officially end the Korean War as a first step towards normalized relations. The fact that our government is reluctant to publicly acknowledge the contested nature of the NLL or pursue an end to the Korean War raises important questions about the motivations driving our own foreign policy. The Australian Government’s Productivity Commission–an Australian Government research and advisory body–just issued a 400 page report on the effects of Australia’s existing “Free Trade” Agreements (FTAs). This is a timely report. Before 2003, Australia had only one free trade agreement with New Zealand. Since then, the Australian government has signed agreements with the ASEAN countries, Chile, Singapore, Thailand and the U.S. And, it is currently negotiating new agreements with China, the Gulf Co-operation Council, Indonesia, Japan, Korea, Malaysia, and the Pacific Island Forum. The Productivity Commission has told the government there is little evidence to suggest Australia’s six free-trade agreements have produced ”substantial commercial benefits”…. There does not appear to be an underlying economic problem that necessitates the inclusion of ISDS [Investor-State Dispute Settlement] provisions within agreements…..Experience in other countries demonstrates that there are considerable policy and financial risks arising from ISDS provisions. One could only wish for such honesty from a U.S. government advisory board. Our government is eagerly pursing ratification of a number of new FTAs (including with South Korea), all of which contain numerous restrictions on the ability of governments to regulate economic activity in the public interest and Investor-State Dispute Settlement provisions. And, all of which have been oversold, at least as far as their effects on working people are concerned. A recent story in USA Today highlights a significant labor market development: Older workers cannot afford to stop working and younger workers cannot find work. The number of people 55 and older holding jobs is on track to hit a record 28 million in 2010 while young people increasingly are squeezed out of the labor market . . . . The portion of people ages 16-24 in the labor market is at the lowest level since the government began keeping track in 1948, falling from 66% in 2000 to 55% this year. There are 17 million in that age group who are employed, the fewest since 1971 when the population was much smaller. By contrast, people in their 50s, 60s or 70s are staying employed longer than at any time on record. For example, 55% of people ages 60 to 64 were in the labor market during the first 11 months of 2010, up from 47% for the same period in 2000. The chart below highlights these trends. And of course attacks on social security will only serve to force older workers to remain working longer. Given the lack of private sector job creation, this development is bound to make it even harder for younger workers to find employment. This is not a healthy development and one that will not be easily reversed without significant structural changes in the workings of our economy. President Obama’s Tax Deal–Who is Celebrating? President Obama has agreed to a tax deal that pushes us further down the road to social disaster. In exchange for keeping the Bush tax cuts for 98 percent of the population for two additional years, President Obama has agreed to maintain lower tax rates for the top 2 percent as well. In two years, when it is election time and the economy remains stagnate, the pressure to make those tax cuts permanent will be immense. It is hard to imagine President Obama successfully resisting that pressure. Once those tax cuts become permanent, the demands to cut social spending in order to reduce the growth in the federal deficit (made worse by the tax cuts) will intensify. The tax deal also includes a one year extension of extended unemployment benefits. Unfortunately, unemployment is predicted to remain high for at least two more years. The odds are great that these extended benefits will not be renewed and millions of people will join the millions already living in poverty. The tax deal also reduces the inheritance tax on big estates while raising the value at which the tax would take effect. The result will be a major loss of tax revenue, adding to pressures for cuts in social programs to reign in the federal deficit. President Obama argues that all these measures will put money into people’s hands, promoting spending—a second stimulus in other words. But the tax cut deals will only maintain what we already have—that is no stimulus. The other parts of the deal will certainly help to keep spending from sinking further, but they do nothing to promote a revitalization and restructuring of our economy. As a consequence, in two years we will face problems similar to those we face now, but with an even more distorted tax code and hightened threats to our Social Security system. The web page cites the support of five economists. Peter Cardillo, the Bank of America, Greg Mankiw, and Wells Fargo (are the second through fifth economists on Obama’s list). . . .
Cardillo is an economist for an investment firm, Avalon Partners. Avalon’s web site states that it specializes in “wealth management” for “affluent investors…to meet the unique needs of high net worth individuals….” Yes, the wealthiest one-hundredth of one percent of Americans — the truly, uniquely needy. The Bank of America (BoA) is next on the administration’s list of supporters. BoA’s senior leadership will personally save millions of dollars in taxes and its wealthy clients will save billions of dollars in taxes because of Obama’s decision to support the continuation of the Bush tax cuts for the wealthiest Americans. . . . Professor Mankiw, Chairman of George W. Bush’s Council of Economic Advisors, is the next supporter that the Obama administration highlights. Mankiw was a leading apologist for the Bush tax cuts for the wealthy. Wells Fargo is next on Obama’s roll of honor. Wells Fargo’s senior leaders, like BoA and Avalon Partners’ senior leaders, have personal and professional interests in supporting tax cuts for the wealthy. Wells Fargo is overjoyed by Obama’s agreement to extend tax cuts for the wealthy. All of these endorsements simply emphasize the extent to which Obama was taken to the cleaners. It’s bad to be bullied, but it’s pathetic to cite the testimonials of those that got even wealthier through the bullies’ triumph as evidence of your success. It is hard to know what to say. However, I think there is more going on here than a simple matter of bullying. Congress continues to debate, well perhaps discuss, whether to renew emergency unemployment benefit programs. These programs expired as of December 1. So, far, it appears that their renewal is being held hostage to an extension of Bush-era tax cuts for the super rich. What will it mean if Congress refuses to renew existing extended unemployment programs? Most directly, disaster for the millions who will be effected. But beyond that, as a report issued by the President’s Council of Economic Advisers makes clear, the loss of benefits will further depress consumer spending and significantly lower growth, raising chances of a new recession. To appreciate the disaster in the making, here is some background on the programs up for renewal. Workers in all states are eligible to receive up to 26 weeks of Unemployed Insurance (UI) benefits from the regular state-funded unemployment compensation program. Workers in any state who exhausted their regular UI benefits were eligible (before the program expired) to receive up to 34 additional weeks of benefits through the temporary federal Emergency Unemployment Compensation (EUC) program (which was enacted in 2008). That number went up to 53 weeks in states that had especially high unemployment rates. 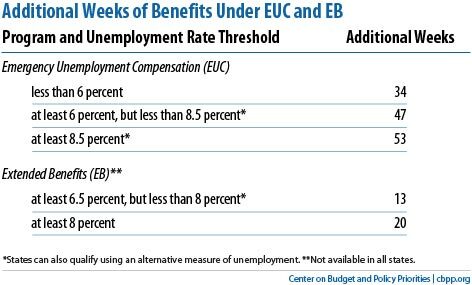 So, depending on what state you live in and how bad the unemployment rate is, an unemployed person would receive the base 26 weeks, possibly an additional 53 weeks under the EUC program, and possibly a further 20 weeks under the EB program, for a maximum total of 99 weeks. A record high 1.4 million workers have already exhausted their 99 weeks of coverage–approximately 9 percent of all unemployed workers; those workers are no longer eligible for any unemployment support. These are the 99ers. Many of them and their supporters are pushing for a new program, one that would extend coverage beyond the 99 weeks. However, what is up for debate now in Congress is not an extension of benefits beyond 99 weeks, but rather the renewal of the EUC and EB programs. Because Congress let these programs expire December 1, the unemployment benefit system has returned to its maximum 26 weeks of coverage. This means that millions of people who would have maintained coverage beyond the 26 week limit are going to lose coverage once they run though the weeks corresponding to the program that now provides them benefits. So, for example, workers receiving EUC benefits will not be eligible for EB benefits. And workers receiving UI benefits will not be eligible for EUC benefits. And of course all new unemployed will be limited to 26 weeks. More than 6.3 million workers were out of a job for at least 27 weeks in November 2010 (nearly 42 percent of all unemployed Americans). Moreover, according to recent Federal Reserve forecasts, the unemployment rate is likely to be as high as 9 percent in December 2011 and 8 percent in December 2010. Even if Congress eventually votes to renew the extended unemployment benefit programs, the Bureau of Labor Statistics estimates that some 4 million unemployed who are currently covered will run through their 99 weeks by the end of 2011. If the programs are not renewed, some 8-10 million workers will likely be without benefits by the end of 2011. According to the Council of Economic Advisers’ report noted above, the income of the typical household with a member receiving emergency unemployment benefits would fall by one-third if those benefits are lost. We are looking at a real social disaster. Year by year we face ever worsening trade-offs. Now it appears that in order to maintain a minimal system of social support for the unemployed we must provide the super rich with years of additional tax cuts. And, as of now, there is no guarantee that even this exchange will be enough to close the deal. Go here for some powerful visuals on employment/unemployment trends. The U.S. media continues to promote a very one-sided view of developments on the Korean peninsula. The danger is that this one-sided view may, intentionally or not, encourage actions likely to lead to a new Korean war, possibly a nuclear one. The most important thing to say is that since the end of the Soviet Union and the breakup of the Soviet-centered trading system that supported the North Korean economy, the North Korean government has sought to normalize relations with the U.S. It has called for direct negotiations and the signing of a peace treaty to finally bring an end to the Korean War; at present we have only the armistice which ended the fighting. The U.S. has largely rejected all overtures, preferring to keep the North isolated and weak. For example, the U.S. continues to embargo the North and veto its attempts to join the World Bank and IMF. The North, for its part, has found that the only way it can get the U.S. to the negotiating table is with military threats, thus its past missile firings and testing of nuclear weapons. However, the negotiations rarely last long, an outcome that only restarts the cycle in ever more dangerous ways. The issue here is not whether one likes the North Korean government. The issue here is whether the U.S. government is sincerely interested in peace on the Korean peninsula. The current crisis on the Korean peninsula was touched off by massive South Korean organized war games–involving over 70,000 soldiers, 600 tanks, 500 warplanes, 90 helicopters, and 50 warships–that were explicitly directed at the North. As part of the war games, the South Korean military engaged in live artillery fire into waters claimed by North Korea. The North repeatedly demanded that the South halt the firing, and when the South refused, the North fired its own artillery at a South Korean military installation on an island some seven miles off the North Korean coast. Two soldiers and two civilian military contractors were killed. The South then fired back, causing unknown causalities in the North. The U.S. government responded to these developments by sending the nuclear-powered aircraft carrier, the USS George Washington (carrying 75 warplanes and a crew of over 6000), and other warships to conduct additional joint war exercises with the South Korean military. Thankfully, it appears that a further escalation has been avoided, at least for the moment. The North has apologized for the deaths and the South has decided not to renew its coastal live-fire artillery exercise. The key to understanding what is happening now on the Korean peninsula is the fact that the a state of war continues to exist. Without direct talks aimed at achieving an end to the Korean War and the normalization of relations between the two Koreas and between the North and the U.S., the region will remain a tinderbox. This is not an impossible task. For example, in October 2007, an inter-Korean summit meeting between Roh Moo-Hyun (the previous South Korean president) and Kim Jong Il (the North Korean leader) produced a commitment by both sides to negotiate a joint fishing area and create a “peace and cooperation zone” in the West Sea in order to transform the heavily militarized waters into a maritime region for economic cooperation. Tragically, a few months later, the newly elected (and current) president of South Korea, Lee Myung-bak, rejected the agreements that were reached at that summit and at the previous one held in 2000. Significantly, while the U.S. quickly endorsed the South Korean charge, there is strong reason to believe that the ship sank because it ran aground, and that the South Korean government sought to blame the North in hopes that it could use the crisis to improve its chances in national assembly elections. A South Korean newspaper, the Hankyoreh, did an excellent job of highlighting the problems with the government’s case in a 30 minute TV program (with English subtitles) that can be viewed below. Perhaps the most compelling evidence casting doubt on the South Korean government’s claim that the Cheonan was torpedoed by a North Korean submarine is the fact that all the Cheonan victims died of drowning, nearly all of the 58 surviving crew members escaped serious injury, and the ship’s internal instruments remained intact. According to several scientists who have modeled the likely results of a torpedo explosion, the entire crew would have been sent flying, leading to fractured bones and the destruction of instruments. Unfortunately, the U.S. media never reports that South Korean government claims of North Korean responsibility for the sinking of the Cheonan are widely challenged in the South. Rather, the incident is viewed as another example of the North’s reckless behavior, a framing that colors popular perceptions in this country of current tensions and encourages increasingly strident calls for military action against the North.